This hull is the fourth model that focuses on bringing family members together to go boating. 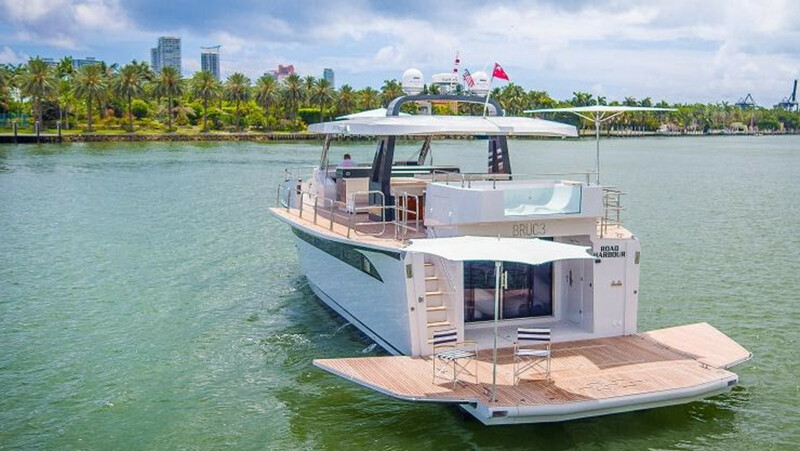 G Marine, Miami&apos;s exclusive dealer to the Americas for the 100-year old shipbuilder Astondoa brings a new Top Deck model to South Florida to celebrate the summer. The features of the 65 Top Deck include expansive outdoor spaces to accommodate eight people on the sunbathing deck, 12 people seated at the top deck table, six seated at a bar and room for several others on the swim platform. It also has room for several toys including personal watercraft or a 14-foot tender, paddleboards, snorkel and dive gear in the garage. Besides the bar, the boat also has a galley and grill. "This boat is at its best when filled with people,” G Marine’s David Galante said in a statement. "It packs the space of a 120-foot yacht into 65 feet, where everyone can find space, things to do and have fun." Several years ago, a Mexican entrepreneur conceived the concept of the Top Deck as his dream boat — a "floating island" that could accommodate a lot of people. The fold-out "wings" that extend the footprint of the boat are utilized on both the upper deck as well as the swim platform, creating while at anchor or mooring, an expanded space for passengers. The first generation was a 63-foot Top Deck designed by Luiz de Basto and constructed by Astondoa.